Pirates of the Carribbean are more than just fantastical freebooters as portrayed in the Hollywood blockbuster film series. They’re legitimate historical figures and the perfect teaching hook for Laurier professor Jeff Grischow, who introduced his students to the history of piracy, slavery and colonialism in Puerto Rico with a spring 2017 field course experience. “Field courses make the text books real,” says Grischow, who designed the second-year course Themes in Puerto Rican History in 2015 as part of a residence learning community (RLC) at Laurier’s Waterloo campus. After an intensive in-class component, Grischow and 19 students spent 11 days in Puerto Rico for an exceptional page-to-reality learning experience supported by the Dean of Arts Office. 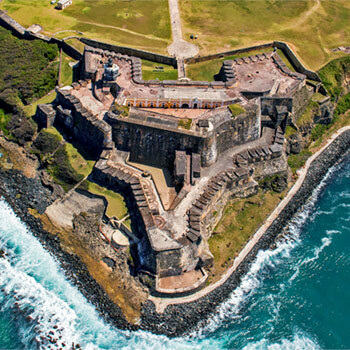 The group toured Castillo San Cristóbal and Castillo San Felipe del Morro, two massive forts erected at opposite ends of Puerto Rico’s island capital city of San Juan. The Spanish Empire settled San Juan in the early sixteenth century, building the forts and walling in the city to defend against European pirates and their interest in Puerto Rico’s strategic location on the route of Spanish treasure ships. At Castillo San Cristóbal, students stood at the fort’s lookout posts, scanning the same strip of ocean horizon for European pirate ships just as Spanish defenders did over 350 years ago. While at Castillo San Felipe del Morro, commonly known as El Morro, Grischow’s students saw the execution post where legendary, nineteenth-century Puerto Rican pirate Roberto Cofresi met his end. Cofresi is often celebrated by Puerto Ricans for his Robin Hood-like ways of stealing from the rich and giving to the poor while outrunning the Spanish is his famed ship Anne. While the topic of pirates is exciting, it’s related to a far less colourful part of the country’s past: colonialism and slavery. Spanish settlers enslaved Puerto Rico’s native Taíno people to mine gold. As the Taíno died off from diseases introduced through colonialism, the Spanish turned to the west coast of Africa for imported slave labour. African slaves worked in fields of sugar mills like those at Hacienda la Esperanza. While here, Grischow’s group viewed the memorial collection of machetes used by the mill’s slaves to harvest sugar cane. “Seeing the machetes was very moving for the students,” says Grischow. Machetes used by La Esperanza's slaves were too short and dull for harvesting sugarcane stalks properly. Slaves had to hunch over to hack the stalk from the soil, which contributed to some to physical deformations. Petitions to the local authorities from the mill’s slaves protesting their mistreatment accompany the machete collection. History student and former RLC don Braeden Suggit says the field course experience provides far more than a glimpse into Puerto Rico’s past. “Visiting historic sites and understanding the colonial past helps bring the country’s uncertain present in to a better perspective,” says Suggitt. Puerto Rico held a referendum on June 11 – just days after Grischow and his students left – to vote on their national status. Since 1898, Puerto Rico has been an unincorporated territory of the United States, ceded by the Spanish at the end of the Spanish-American War. Voters could chose to remain as a territory, seek independence from the United States, or become an American state. While the majority voted for statehood, only 23 per cent of the country’s voters participated. “Years of colonial occupation have resulted in some strong feelings towards the Americans,” said Suggitt. For Suggitt, the group’s visit to the island of Vieques, located off Puerto Rico’s east coast, offered a tangible, anti-colonial climate. The island was used as a training site and bombing range by the US Navy from 1941 to 2003. Protests over the navy’s use of the island broke out in 1999 when David Sanes Rodríguez, a Vieques resident and base employee, was killed during a bombing accident. Access to parts of the island are restricted due to contamination, and cancer rates on Vieques are also reported to be higher than those on mainland Puerto Rico. Locals lay blame on the United States, who ceased military operations in 2003 and left Vieques. Suggitt, who took the World War I battlefield tour course in 2015, says he never imagined himself travelling abroad while earning degree credits when he was deciding on which university to attend. A leader in the field, Laurier offers a variety of experiential learning opportunities – from co-operative education, field placements, internships and laboratory experience to entrepreneurial activities, community-engaged learning, research, teaching apprenticeships and international experiences. Students can log their experiential learning activities in a Student Experiential Record, launched earlier in 2017, to create a comprehensive portfolio of learning experienced inside – and out – of the classroom.